These are clips from some of Clint Eastwood's movies and interviews that we think he may have left behind on a sheet of paper when he came out onto the podium in Tampa last night. 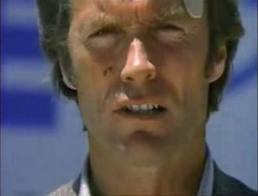 He is 82 now, and after all, he is Clint Eastwood. He can sorta do whatever he wants by now, can't he? 'We own this country. Politicians work for us. When they don't do the job, we gotta let them go'. We all hate bureacracy, don't we? Red, blue, purple, white, black, Asian. America as a nation that has always been suspicious and wary of concentrated power in the hands of the few. Why should our generation be any different than any that has gone before us? That is the main problem I have with President Obama. He seems to love more bureaucracy! Show me where he hasn't exhibited a predisposition to pass more legislation and regulations and rely more on the ingenuity and resiliency of the American entrepreneur and worker and I might change my mind. Some. But I doubt it. Same with politics. It is 'only' politics. I was Mayor of Carmel, California for 2 years, remember, so I know the difference between campaigning and governing. The important part to remember that once the 'fun' and the 'dirty' parts of politics are over and done with on Election Day, you have to govern this nation as a whole, not as part of a whole. President Obama has failed to unite us a nation and has instead chosen to use division and class warfare to separate us from each other. I can't abide by that. America was made by rebels. Rebels who left Europe and England because of religious oppression. Rebels who couldn't stand the dictates of a distant King across the ocean. Rebels who fought the Civil War before America could be birthed a new freedom in 1865. Rebels who fought for the rights of women to vote in the early 20th century. Rebels like Martin Luther King who fought for the full rights of our fellow African-American citizens. The day America loses its sense of James Dean, John Wayne, and, yes, Clint Eastwood, then we will really have problems. 'A Little Rebellion is a Good Thing' as Thomas Jefferson would say. We all have our failures and our faults. It isn't just the Republicans who are bad or the liberals. We want a leader who will bring out the 'better part of our angels' as Ronald Reagan referred repeatedly. That is how we are going to solve these problems and heal this nation, together, as one nation, one society, one America. 'President Obama seems like a nice man. Except when he allows his political henchmen such as David Axelrod and David Plouffe to run those awful ads accusing Mitt Romney of murdering that lady who contracted cancer after working at a company in which Bain Capital had invested. He is just not a budget or a numbers guy. He has not shown any predisposition to attack or arrest the explosion of these budget deficits which have now AVERAGED $1.3 trillion per year during the 3 years he had full control of the budget. He has personally allowed $12 trillion of new debt to be either created or not eliminated due to his actions/inactions as Budget Commander-in-Chief. He has not seen one federal program outside of the defense program that he thinks is bloated, wasteful or due for major significant reforms and reductions. Everything in the federal budget has gone way up in cost and price under President Obama, not down. He has got to know his limitations in this regard. If he doesn't, then that is reason enough to just 'let him go'. Vote for Mitt Romney and Paul Ryan. There! I have said it. I am from Hollywood and I approve this message.